Sgt. 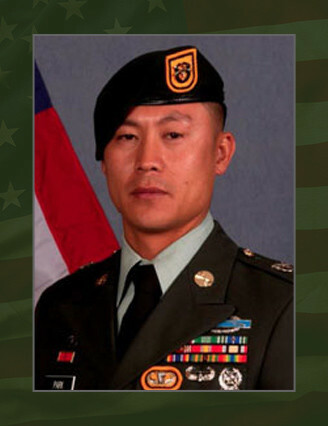 1st Class Dae Han Park, 36, of Lacey, Wash., died after his vehicle was struck by an improvised explosive device March 12, 2011 in the vicinity of Kajran, Daykundi, Afghanistan. Park was assigned to Charlie Company, 3rd Battalion, 1st Special Forces Group (Airborne), Joint Base Lewis-McChord, Wash. and was deployed in support of Operation Enduring Freedom-Afghanistan. This was Park’s fourth deployment in support of overseas contingency operations. Park, a graduate of Watertown High School in Watertown, Conn., enlisted in the U. S. Army in February 1998, as an Infantryman. Upon completion of basic training and advanced individual training, Park was assigned to Charlie Company, 3rd Bn., 327th Infantry Regiment, Fort Campbell, Ky. In 2000, he earned the coveted Ranger Tab and participated in the Best Ranger Competition in 2002. In March 2003 he deployed in support of Operation Iraqi Freedom, as a rifle squad leader. Upon his return from Iraq, Park was assigned as an observer/controller at the Joint Readiness Training Center at Fort Polk, La. In 2005, Park volunteered for the Special Forces Assessment and Selection Course and completed the Special Forces Qualification Course in 2006. Park was then assigned to 3rd Bn, 1st SFG (A) Joint Base Lewis-McChord as a Special Forces communications sergeant with Operational Detachment Alpha 1333. During his time with 3rd Bn, he completed numerous worldwide missions to include: Bangladesh, Operation Iraqi Freedom VI, Operation Enduring Freedom-Philippines, Cambodia, and India. This was his first rotation to Afghanistan. Park’s military education includes the U.S. Army Airborne School, Warrior Leader Course, Basic Non-Commissioned Officers Course, Advanced Leader Course, Ranger School, Air Assault School, Survival, Evasion, Resistance, and Escape Course, Jumpmaster Course, Special Operations Target Interdiction Course and Special Forces Qualification Course. Park’s awards and decorations include the Bronze Star Medal, two Army Commendation Medals, two Army Achievement Medals, four Army Good Conduct Medals, the National Defense Service Medal, the Iraq Campaign Medal, Global War on Terror Expeditionary Medal, Global War on Terror Service Medal, two Overseas Service Ribbons, three Non-commissioned Officer Professional Development Ribbons, Army Service Ribbon, Special Forces Tab, Ranger Tab, Combat Infantryman’s Badge, Expert Infantryman’s Badge, Parachutist’s Badge, and the Air Assault Badge. He is survived by his wife, Mi Kyong Park; his daughters Niya and Sadie; his parents Joseph and Bonnie Schneider of Thomaston, Conn.; and his sister and brother, Katie and Saejin of Watertown.